Bandwagon you say? Eachine’s micro fpv racers are multiplying like rabbits but who cares its better for us. The Eachine Lizard 95 is a micro FPV racer that defies all expectations of a micro quad. 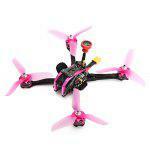 This little guy is powered by a 3S lipo comes with a 2.5 mm base frame that is both tough for a micro and yet light. It comes with a F3 Omnibus fc, 4 in 1 10a BLheli_S dshot600. The motors are 1104 – 6000kv motors. The Eachine lizard 95 comes in different receivers for different Transmitters. flysky, frsky, and spectrum. This little beast flies like a monster on 3S and can is very stable. You can go down to 2s if you want. The Eachine Lizard 95 very agile for a 3S and can definitely do flips and rolls out of the box. For the price, u get 2 sets of 2inch props but its 5 blades. I highly recommend changing down to 4 blades. The 550mah 3S lipos can allow it to achieve a flight time of between 3mins – 5mins. For a sub 100mm racer this guy does pack a punch. The VTX is a switchable VTX from 25mw & 100mw. It is enough to for this micro to operate. During testing, i have crashed several times but this frame is still intact. It is very tough. The VTX aio cam gets really hot. The props are overkill for its size. If you are want a micro quad to test out and fly indoors, you can get this as a start to practise around.